Kobayashi Denzai Co. Ltd., was established with a starting capital of ¥500,000 in Japanese Yen as an affiliate of Totoku Electric Co., Ltd., a distributor for Fujitsu Limited and a dealer for Fuji Electric Co., Ltd. Became a semiconductor distributor of Fuji Electric Co., Ltd. Became a distributor of Fujitsu's FACOM computers. Corporate name changed to Kobayashi Denshi Sangyo Co., Ltd.
Capital increased to ¥30 million in Japanese Yen. Became the authorized distributor of Fujitsu FACOM computers. Capital increased to ¥106 million in Japanese Yen. Capital increased to ¥300.2 million in Japanese Yen. Awarded dealership of Fujitsu system products. Capital increased to ¥1,208.5 million in Japanese Yen. Capital increased to ¥2,293 million in Japanese Yen. Concluded a partnership contract with Fujitsu Limited. Corporate name changed to Solekia Limited. Canceled OTC dealings at JSDA and Listed on JASDAQ. Listed on the Tokyo Stock Exchange JASDAQ(standard), after merger of Tokyo Stock Exchange and Osaka Securities Exchange. 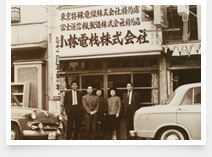 Solekia has grown steadily for more than 50 years since the foundation of the company (1958), and now builds a network of Branches and Support & Service Centers all over Japan to serve our customers in the neighborhood. Solekia will adhere to its mission, "corporate value enhancement" by strengthening human resource and technology capability, and continue challenging and stepping forward to a new world.